The Academy Awaird for Best Supportin Actress is an awaird presentit annually bi the Academy of Motion Picture Arts and Sciences (AMPAS). It is gien in honour o an actress wha haes delivered an ootstaundin performance in a supportin role while wirkin within the film industry. In the follaein table, the years are leetit as per Academy convention, an generally correspond tae the year o film release in Los Angeles Coonty; the ceremonies are always held the follaein year. Alice Brady wan for her performance in 1937's In Old Chicago. Hattie McDaniel wan in 1939 for her role as Mammy in Gone with the Wind, sicweys acomin the first black performer tae win an Oscar. Jane Darwell wan for her performance as Ma Joad in The Grapes of Wrath (1940). Teresa Wright wan for her role in 1942's Mrs Miniver. Celeste Holm wan for her performance in Gentleman's Agreement (1947). Donna Reed wan for her role in From Here to Eternity (1953). Eva Marie Saint wan in 1954 for her performance in On the Waterfront. Wendy Hiller wan in 1958 for her performance in Separate Tables. Shelley Winters wan twa awairds in this category for her roles in The Diary of Anne Frank (1959) an A Patch of Blue (1965). Rita Moreno wan for her role in 1961's West Side Story. Patty Duke wan in 1962 for her role as Helen Keller in The Miracle Worker. Goldie Hawn wan in 1969 for her role in Cactus Flower. At age 10, Tatum O'Neal acame the youngest winner an nominee in this category for her role in Paper Moon. Vanessa Redgrave wan in 1977 for her portrayal o the teetular character in Julia. Mary Steenburgen wan for her role in 1980's Melvin and Howard. 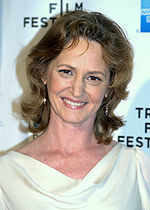 At age 77, Peggy Ashcroft acame the auldest winner in this category for her role in A Passage to India (1984). Anjelica Huston wan in 1985 for her performance in Prizzi's Honor. Dianne Wiest wan for her performances in Hannah and Her Sisters (1986) an Bullets over Broadway (1994); films which war baith directit bi Woody Allen. Olympia Dukakis wan in 1987 for her performance in Moonstruck. Geena Davis wan in 1988 for her role in The Accidental Tourist. Whoopi Goldberg wan for her role as Oda Mae Brown in Ghost (1990). Judi Dench wan in 1998 for her performance as Queen Elizabeth I in Shakespeare in Love. Angelina Jolie wan for her performance in 1999's Girl, Interrupted. Renée Zellweger wan for her role in Cold Mountain (2003). Cate Blanchett wan for her performance as Katharine Hepburn in The Aviator (2004), acomin the first performer tae win an Oscar for portrayin a real-life Oscar winner. Rachel Weisz wan for her performance in The Constant Gardener (2005). Jennifer Hudson wan for her performance as Effie White in Dreamgirls (2006). Tilda Swinton wan for her performance in Michael Clayton (2007). Penélope Cruz received twa consecutive nominations an wan for her role in Vicky Cristina Barcelona (2008), acomin the first Spaingie actress tae win an Oscar. 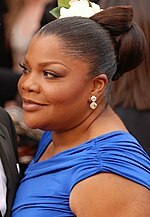 Mo'Nique wan for her role in Precious (2009). Melissa Leo wan for her role as Alice Eklund-Ward in The Fighter (2010). 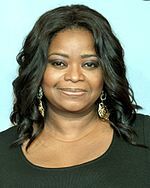 Octavia Spencer wan for her role as Minny Jackson in The Help (2011). Anne Hathaway wan for portrayin Fantine in Les Misérables (2012). Lupita Nyong'o wan for her role as Patsey in 12 Years a Slave (2013). Patricia Arquette wan for her role in Boyhood (2014). Alicia Vikander wan for her performance in The Danish Girl (2015). 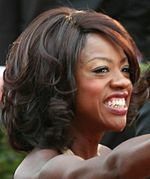 Viola Davis wan for her performance in Fences (2016). Woodard !Alfre Woodard Cross Creek Beatrice "Geechee"
↑ "The 9th Academy Awards (1937) Nominees and Winners". Academy of Motion Picture Arts and Sciences (AMPAS). Retrieved August 27, 2013. ↑ "The 10th Academy Awards (1938) Nominees and Winners". Academy of Motion Picture Arts and Sciences (AMPAS). Retrieved August 27, 2013. ↑ "The 11th Academy Awards (1939) Nominees and Winners". Academy of Motion Picture Arts and Sciences (AMPAS). Retrieved August 27, 2013. ↑ "The 12th Academy Awards (1940) Nominees and Winners". Academy of Motion Picture Arts and Sciences (AMPAS). Retrieved August 27, 2013. ↑ "The 13th Academy Awards (1941) Nominees and Winners". Academy of Motion Picture Arts and Sciences (AMPAS). Retrieved August 27, 2013. ↑ "The 14th Academy Awards (1942) Nominees and Winners". Academy of Motion Picture Arts and Sciences (AMPAS). Retrieved August 27, 2013. ↑ "The 15th Academy Awards (1943) Nominees and Winners". Academy of Motion Picture Arts and Sciences (AMPAS). Retrieved August 27, 2013. ↑ "The 16th Academy Awards (1944) Nominees and Winners". Academy of Motion Picture Arts and Sciences (AMPAS). Retrieved August 27, 2013. ↑ "The 17th Academy Awards (1945) Nominees and Winners". Academy of Motion Picture Arts and Sciences (AMPAS). Retrieved August 27, 2013. ↑ "The 18th Academy Awards (1946) Nominees and Winners". Academy of Motion Picture Arts and Sciences (AMPAS). Retrieved August 27, 2013. ↑ "The 19th Academy Awards (1947) Nominees and Winners". Academy of Motion Picture Arts and Sciences (AMPAS). Retrieved August 27, 2013. ↑ "The 20th Academy Awards (1948) Nominees and Winners". Academy of Motion Picture Arts and Sciences (AMPAS). Retrieved August 27, 2013. ↑ "The 21st Academy Awards (1949) Nominees and Winners". Academy of Motion Picture Arts and Sciences (AMPAS). Retrieved August 27, 2013. ↑ "The 22nd Academy Awards (1950) Nominees and Winners". Academy of Motion Picture Arts and Sciences (AMPAS). Retrieved August 27, 2013. ↑ "The 23rd Academy Awards (1951) Nominees and Winners". Academy of Motion Picture Arts and Sciences (AMPAS). Retrieved August 27, 2013. ↑ "The 24th Academy Awards (1952) Nominees and Winners". Academy of Motion Picture Arts and Sciences (AMPAS). Retrieved August 27, 2013. ↑ "The 25th Academy Awards (1953) Nominees and Winners". Academy of Motion Picture Arts and Sciences (AMPAS). Retrieved August 27, 2013. ↑ "The 26th Academy Awards (1954) Nominees and Winners". Academy of Motion Picture Arts and Sciences (AMPAS). Retrieved August 27, 2013. ↑ "The 27th Academy Awards (1955) Nominees and Winners". Academy of Motion Picture Arts and Sciences (AMPAS). Retrieved August 27, 2013. ↑ "The 28th Academy Awards (1956) Nominees and Winners". Academy of Motion Picture Arts and Sciences (AMPAS). Retrieved August 27, 2013. ↑ "The 29th Academy Awards (1957) Nominees and Winners". Academy of Motion Picture Arts and Sciences (AMPAS). Retrieved August 27, 2013. ↑ "The 30th Academy Awards (1958) Nominees and Winners". Academy of Motion Picture Arts and Sciences (AMPAS). Retrieved August 27, 2013. ↑ "The 31st Academy Awards (1959) Nominees and Winners". Academy of Motion Picture Arts and Sciences (AMPAS). Retrieved August 27, 2013. ↑ "The 32nd Academy Awards (1960) Nominees and Winners". Academy of Motion Picture Arts and Sciences (AMPAS). Retrieved August 27, 2013. ↑ "The 33rd Academy Awards (1961) Nominees and Winners". Academy of Motion Picture Arts and Sciences (AMPAS). Retrieved August 27, 2013. ↑ "The 34th Academy Awards (1962) Nominees and Winners". Academy of Motion Picture Arts and Sciences (AMPAS). Retrieved August 27, 2013. ↑ "The 35th Academy Awards (1963) Nominees and Winners". Academy of Motion Picture Arts and Sciences (AMPAS). Retrieved August 27, 2013. ↑ "The 36th Academy Awards (1964) Nominees and Winners". Academy of Motion Picture Arts and Sciences (AMPAS). Retrieved August 27, 2013. ↑ "The 37th Academy Awards (1965) Nominees and Winners". Academy of Motion Picture Arts and Sciences (AMPAS). Retrieved August 27, 2013. ↑ "The 38th Academy Awards (1966) Nominees and Winners". Academy of Motion Picture Arts and Sciences (AMPAS). Retrieved August 27, 2013. ↑ "The 39th Academy Awards (1967) Nominees and Winners". Academy of Motion Picture Arts and Sciences (AMPAS). Retrieved August 27, 2013. ↑ "The 40th Academy Awards (1968) Nominees and Winners". Academy of Motion Picture Arts and Sciences (AMPAS). Retrieved August 27, 2013. ↑ "The 41st Academy Awards (1969) Nominees and Winners". Academy of Motion Picture Arts and Sciences (AMPAS). Retrieved August 27, 2013. ↑ "The 42nd Academy Awards (1970) Nominees and Winners". Academy of Motion Picture Arts and Sciences (AMPAS). Retrieved August 27, 2013. ↑ "The 43rd Academy Awards (1971) Nominees and Winners". Academy of Motion Picture Arts and Sciences (AMPAS). Retrieved August 27, 2013. ↑ "The 44th Academy Awards (1972) Nominees and Winners". Academy of Motion Picture Arts and Sciences (AMPAS). Retrieved August 27, 2013. ↑ "The 45th Academy Awards (1973) Nominees and Winners". Academy of Motion Picture Arts and Sciences (AMPAS). Retrieved August 27, 2013. ↑ "The 46th Academy Awards (1974) Nominees and Winners". Academy of Motion Picture Arts and Sciences (AMPAS). Retrieved August 27, 2013. ↑ "The 47th Academy Awards (1975) Nominees and Winners". Academy of Motion Picture Arts and Sciences (AMPAS). Retrieved August 27, 2013. ↑ "The 48th Academy Awards (1976) Nominees and Winners". Academy of Motion Picture Arts and Sciences (AMPAS). Retrieved August 27, 2013. ↑ "The 49th Academy Awards (1977) Nominees and Winners". Academy of Motion Picture Arts and Sciences (AMPAS). Retrieved August 27, 2013. ↑ "The 50th Academy Awards (1978) Nominees and Winners". Academy of Motion Picture Arts and Sciences (AMPAS). Retrieved August 27, 2013. ↑ "The 51st Academy Awards (1979) Nominees and Winners". Academy of Motion Picture Arts and Sciences (AMPAS). Retrieved August 27, 2013. ↑ "The 52nd Academy Awards (1980) Nominees and Winners". Academy of Motion Picture Arts and Sciences (AMPAS). Retrieved August 27, 2013. ↑ "The 53rd Academy Awards (1981) Nominees and Winners". Academy of Motion Picture Arts and Sciences (AMPAS). Retrieved August 27, 2013. ↑ "The 54th Academy Awards (1982) Nominees and Winners". Academy of Motion Picture Arts and Sciences (AMPAS). Retrieved August 27, 2013. ↑ "The 55th Academy Awards (1983) Nominees and Winners". Academy of Motion Picture Arts and Sciences (AMPAS). Retrieved August 27, 2013. ↑ "The 56th Academy Awards (1984) Nominees and Winners". Academy of Motion Picture Arts and Sciences (AMPAS). Retrieved August 27, 2013. ↑ "The 57th Academy Awards (1985) Nominees and Winners". Academy of Motion Picture Arts and Sciences (AMPAS). Retrieved August 27, 2013. ↑ "The 58th Academy Awards (1986) Nominees and Winners". Academy of Motion Picture Arts and Sciences (AMPAS). Retrieved August 27, 2013. ↑ "The 59th Academy Awards (1987) Nominees and Winners". Academy of Motion Picture Arts and Sciences (AMPAS). Retrieved August 27, 2013. ↑ "The 60th Academy Awards (1988) Nominees and Winners". Academy of Motion Picture Arts and Sciences (AMPAS). Retrieved August 27, 2013. ↑ "The 61st Academy Awards (1989) Nominees and Winners". Academy of Motion Picture Arts and Sciences (AMPAS). Retrieved August 27, 2013. ↑ "The 62nd Academy Awards (1990) Nominees and Winners". Academy of Motion Picture Arts and Sciences (AMPAS). Retrieved August 27, 2013. ↑ "The 63rd Academy Awards (1991) Nominees and Winners". Academy of Motion Picture Arts and Sciences (AMPAS). Retrieved August 27, 2013. ↑ "The 64th Academy Awards (1992) Nominees and Winners". Academy of Motion Picture Arts and Sciences (AMPAS). Retrieved August 27, 2013. ↑ "The 65th Academy Awards (1993) Nominees and Winners". Academy of Motion Picture Arts and Sciences (AMPAS). Retrieved August 27, 2013. ↑ "The 66th Academy Awards (1994) Nominees and Winners". Academy of Motion Picture Arts and Sciences (AMPAS). Retrieved August 27, 2013. ↑ "The 67th Academy Awards (1995) Nominees and Winners". Academy of Motion Picture Arts and Sciences (AMPAS). Retrieved August 27, 2013. ↑ "The 68th Academy Awards (1996) Nominees and Winners". Academy of Motion Picture Arts and Sciences (AMPAS). Retrieved August 27, 2013. ↑ "The 69th Academy Awards (1997) Nominees and Winners". Academy of Motion Picture Arts and Sciences (AMPAS). Retrieved August 27, 2013. ↑ "The 70th Academy Awards (1998) Nominees and Winners". Academy of Motion Picture Arts and Sciences (AMPAS). Retrieved August 27, 2013. ↑ "The 71st Academy Awards (1999) Nominees and Winners". Academy of Motion Picture Arts and Sciences (AMPAS). Retrieved August 27, 2013. ↑ "The 72nd Academy Awards (2000) Nominees and Winners". Academy of Motion Picture Arts and Sciences (AMPAS). Retrieved August 27, 2013. ↑ "The 73rd Academy Awards (2001) Nominees and Winners". Academy of Motion Picture Arts and Sciences (AMPAS). Retrieved August 27, 2013. ↑ "The 74th Academy Awards (2002) Nominees and Winners". Academy of Motion Picture Arts and Sciences (AMPAS). Retrieved August 27, 2013. ↑ "The 75th Academy Awards (2003) Nominees and Winners". Academy of Motion Picture Arts and Sciences (AMPAS). Retrieved August 27, 2013. ↑ "The 76th Academy Awards (2004) Nominees and Winners". Academy of Motion Picture Arts and Sciences (AMPAS). Retrieved August 27, 2013. ↑ "The 77th Academy Awards (2005) Nominees and Winners". Academy of Motion Picture Arts and Sciences (AMPAS). Retrieved August 27, 2013. ↑ "The 78th Academy Awards (2006) Nominees and Winners". Academy of Motion Picture Arts and Sciences (AMPAS). Retrieved August 27, 2013. ↑ "The 79th Academy Awards (2007) Nominees and Winners". Academy of Motion Picture Arts and Sciences (AMPAS). Retrieved August 27, 2013. ↑ "The 80th Academy Awards (2008) Nominees and Winners". Academy of Motion Picture Arts and Sciences (AMPAS). Retrieved August 27, 2013. ↑ "The 81st Academy Awards (2009) Nominees and Winners". Academy of Motion Picture Arts and Sciences (AMPAS). Retrieved August 27, 2013. ↑ "The 82nd Academy Awards (2010) Nominees and Winners". Academy of Motion Picture Arts and Sciences (AMPAS). Retrieved August 27, 2013. ↑ "The 83rd Academy Awards (2011) Nominees and Winners". Academy of Motion Picture Arts and Sciences (AMPAS). Retrieved August 27, 2013. ↑ "The 84th Academy Awards (2012) Nominees and Winners". Academy of Motion Picture Arts and Sciences (AMPAS). Retrieved August 27, 2013. ↑ "The 85th Academy Awards (2013) Nominees and Winners". Academy of Motion Picture Arts and Sciences (AMPAS). Retrieved August 27, 2013. ↑ "The 86th Academy Awards (2014) Nominees and Winners". Academy of Motion Picture Arts and Sciences (AMPAS). Retrieved August 27, 2013. ↑ "The 87th Academy Awards (2015) Nominees and Winners". Academy of Motion Picture Arts and Sciences (AMPAS). Retrieved August 27, 2013. ↑ "The 88th Academy Awards (2016) Nominees and Winners". Academy of Motion Picture Arts and Sciences (AMPAS). Retrieved January 14, 2016. ↑ "The 90th Academy Awards (2018) Nominees and Winners". Academy of Motion Picture Arts and Sciences (AMPAS). Archived frae the oreeginal on March 4, 2017. Retrieved February 11, 2018. This page wis last eeditit on 7 Mairch 2018, at 02:25.